We are slowly building up new and updated regular Orders of Service. Just added is the Order for Advent, which joins that for Creationtide and is available to download. The parish Magazine "The Quarterly" has a new name ! Now known as "The Shell", the first edition is available to download. It can be found under the News section of the main menu. Editions of the old magazine are still available download. The Sermon given by the Rev David Clark at Evensong on Sunday 28th May, after the Manchester bombing atrocity, may be downloaded from here. We have had a number of requests for copies of the Order of Service for Henry's funeral, held at St James the Greater on Tuesday 14th February at 1200. 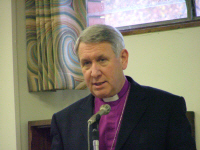 The Address was given by The Very Reverend Dr Derek Hole and a transcript is available here. On a distant shore, but in a greater light. It is with great sadness that we announce the death, on Saturday 28th January 2017, of Reverend Canon Henry Evans MA. Since his retirement from many roles in the diocese, Henry (88) has been a regular, much loved member of our congregation and has served as an Honorary Associate Priest. His funeral service is to be held at St James the Greater on Tuesday 14th February at 1200. The Sermon given by the Rev Michael Holman SJ at Evensong on Sunday 22nd January, to mark the Week of Prayer for Christian Unity, may be downloaded from here. The Winter 2016 edition of the parish Magazine "The Quarterly" is now available to download. It can be found under the News section of the main menu. Previous editions are still available. The Autumn 2016 edition of the parish Magazine "The Quarterly" is now available to download. It can be found under the News section of the main menu. Previous editions are still available. The Summer 2016 edition of the parish Magazine "The Quarterly" is now available to download. It can be found under the News section of the main menu. Previous editions are still available. At the 2016 Annual Parochial Church Meeting on Sunday 24 April, Glynn Richerby, our Vicar for the last 23 years, announced his intention to retire in December. His final service will be the Advent Carol Service on Sunday 27th November. The 2016 Annual Parochial Church Meeting (APCM) is on Sunday, 24 April at 11.45 am (following the 10.30 am service). The Annual Report for 2015 is now available to download and read before the meeting. The Spring 2016 edition of the parish Magazine "The Quarterly" is now available to download. It can be found under the News section of the main menu. Previous editions are still available. It is with deep sadness that we learnt today of the death of our former Director of Music, Mr Theo Saunders. Theo was DoM from 1991 to 2002 and was an inspiration to many young choristers and organists (including Matthew Haynes our current Director). After leaving us he went on to be Director of Music at Saint Patrick's Church of Ireland Cathedral in Armagh, where he stayed, until retiring last year on health grounds. He was a fine organist and a thoroughly likeable man. He will be sadly missed, but will, we are sure, already be playing on the celestial keyboards. Our loss is heavens' gain. The Winter 2015 edition of the parish Magazine "The Quarterly" is now available to download. It can be found under the News section of the main menu. Previous editions are still available. The Summer 2015 edition of the parish Magazine "The Quarterly" is now available to download. It can be found under the News section of the main menu. Previous editions are still available. The 2015 Annual Parochial Church Meeting (APCM) is on Sunday, 26 April at 11.45 am (following the 10.30 am service). The Annual Report for 2014 is now available to download and read before the meeting. An audio recording of the address given by Richard Gill at evensong on Lent 2 in a Lent series on the English Spirit - in Literature may be downloaded from here. The Spring 2015 edition of the parish Magazine "The Quarterly" is now available to download. It can be found under the News section of the main menu. Previous editions are still available. Our congratulations go to former Head Chorister, Joseph Judge, who has just been selected by The National Youth Chamber Choir, the senior ensemble of the National Youth Choirs of Great Britain, as one of the first eight singers in their inaugural Fellowship programme. The Fellowship will run from September 2015 - August 2016 and is a brand new professional development programme which aims to create the most highly-skilled and multi-talented young choral singers in the UK. It offers a unique package of training and benefits to prepare the singers for professional musicianship. The year-long Fellowship will provide extensive training in performance, ensemble work, musical leadership and pedagogy to enable the singers to become outstanding performers and educators, equipped for a successful career in choral music. CAR PARKING is no longer available either behind or in front of Woodside House, 118 London Road (next door to the Vicarage). The business now based there regrets that their insurers expressly disallow third party car parking, also that their business activity regularly requires access to both the front and rear of the property at any time. We are fortunate to have been granted evening and weekend use of parking spaces at 118 for a number of years but everyone must respect these changed circumstances. Parking on the Vicarage forecourt is reserved for Blue Badge holders. Parking is free on Sundays by the sides of Victoria Park and at the top of St James Road. The Winter 2014 edition of the parish Magazine "The Quarterly" is now available to download. It can be found under the News section of the main menu. Previous editions are still available. The Autumn 2014 edition of the parish Magazine "The Quarterly" is now available to download. It can be found under the News section of the main menu. Previous editions are still available. The Summer 2014 edition of the parish Magazine "The Quarterly" is now available to download. It can be found under the News section of the main menu. Previous editions are still available. The Spring 2014 edition of the parish Magazine "The Quarterly" is now available to download. It can be found under the News section of the main menu. Previous editions are still available. COPIES of the Sermon given by the Rev David Clark at Evensong last Sunday, to mark the start of National Interfaith Week, may be downloaded from here. The Winter 2013 edition of the parish Magazine "The Quarterly" is now available to download. It can be found under the News section of the main menu. Previous editions are still available. From Monday 23 September until further notice there will be limited parking next to the Church Hall reserved for blue badge and permit holders only on Sundays. The Vicarage forecourt is also reserved for disabled drivers or drivers of disabled passengers. Please use the car park behind 218 London Road (next to the Vicarage). Information on the repair project to the church towers can be found at the back of the church. Mr Graham Jagger has recently made some information from the Church Archives available electronically as Adobe PDF files. There is an article cbout the foundation of the building and another concerning the War Memorial. It is hoped to expand this list as time goes by. They can be found under Information | Church Archive on the main menu. The Autumn 2013 edition of the parish Magazine "The Quarterly" is now available to download. It can be found under the News section of the main menu. Previous editions are still available. The Summer 2013 edition of the parish Magazine "The Quarterly" is now available to download. It can be found under the News section of the main menu. Previous editions are still available. 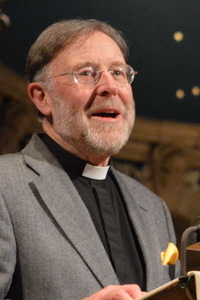 COPIES of the sermon given by David Clark at morning service on Trinity Sunday - may be downloaded from here. The 2013 Annual Parochial Church Meeting (APCM) is on Sunday, 28 April at 11.45 am (following the 10.30 am service). The Annual Report for 2013 is now available to download and read before the meeting. The Parochial Church Council meeting last Tuesday made a clear choice of the 'York' style chair in solid oak with leather seat and backrest - to replace the existing chairs in the Nave and Lady Chapel. We shall now seek the necessary permissions and launch an appeal to meet the cost. More information about the chairs and how you may donate will be available soon. The Spring 2013 edition of the parish Magazine "The Quarterly" is now available to download. It can be found under the News section of the main menu. Previous editions are still available. Every six years, Church Representation Rules determine that an existing Church Electoral Roll must be scrapped and a new Roll prepared in readiness for the APCM. This is such a year. Therefore everyone who wishes to be on the Church Electoral Roll must complete a new application form. You must be on the Electoral Roll to be elected as a Churchwarden or Sidesman or wish to stand for election to the Parochial Church Council. Ideally, everyone connected with St James should be on the Church Electoral Roll. If you would like your name on the Roll then please download the application form, complete, and place it in the box provided at the back of the church, or send to the church office. In order to be eligible to vote at the APCM your form must be returned by Easter Day. Hear the annual carol service from St James the Greater Church in Leicester. Choir Hour: Men and women who have been brought together through a love of singing. The Winter 2012 edition of the parish Magazine "The Quarterly" is now available to download. It can be found under the News section of the main menu. Previous editions are still available. O Taste and See. The Mens', Boys' and Girls' choirs offer a "taste" of the music that they sing week-by-week at the regular two Sunday services and at other occasions throughout the year. The Autumn 2012 Choir Calendar and Music List is now available to download. Would members of the choirs please note that the rehearsal schedule has been drastically changed. The Monday boys' and the Thursday girls' rehearsals have been cancelled and replaced with a 6pm start on Friday. The men remain at 7.30pm. Also, please be aware that the first Sunday back is NOT this Sunday (2nd September) as previously advertised, but Sunday 9th September, with rehearsals starting on Friday 7th September. The rehearsal this week, Friday 31st August, is for those taking part in the Mozart concert in November. The Autumn 2012 edition of the parish Magazine "The Quarterly" is now available to download. It can be found under the News section of the main menu. Previous editions are still available. The Summer 2012 edition of the parish Magazine "The Quarterly" is now available to download. It can be found under the News section of the main menu. Previous editions are still available. The Summer 2012 Choir Calendar and Music List is now available to download. Would members of the choirs please note that rehearsals start again on Friday 20th April at the usual times. Please note that there is NO PRACTICE for the Girls this week as the The Sixteen concert is taking place in church. For more information contact the or BOOK ONLINE here. STOP-BY - a Saturday drop-in for homeless people - is a joint project between the Islamic Society of Britain and the Church of St James the Greater and is supported by Action Homeless. The opportunity to socialise and have a hot lunch, provided by volunteers, started on 7th January and runs from 11.00 until 14.00. Volunteers are still needed plus donations of clothes to be given to those in need - in particular, men's trousers and new underwear plus warm sleeping bags. For more information contact the . ITV's Central News featured this project in a report last Wednesday and it can be viewed on YouTube. The church's Health and Safety Policy is now available to download. The Spring 2012 Choir Calendar and Music List is now available to download. Would members of the choirs please note that rehearsals start again on Thursday 5th January at the usual times. The Winter 2011 edition of the parish Magazine "The Quarterly" is now available to download. It can be found under the News section of the main menu. Previous editions are still available. The Autumn 2011 edition of the parish Magazine "The Quarterly" is now available to download. It can be found under the News section of the main menu. Previous editions are still available. The Autumn 2011 Choir Calendar and Music List is now available to download. Would members of the choirs please note that rehearsals start again on Thursday 1st September at the usual times. New car parking restrictions for the London Road, St James' Road and St James's Terrace come into effect from Monday, 6 June. There will be some Pay and Display spaces - free on Sundays. Many parking bays will be reserved for residents only. You are encouraged to make use of the Church Hall car park and the car park behind 218 London Road (outside of office hours) next door to the Vicarage. Parking on the Vicarage forecourt is reserved for disabled drivers. The Summer 2011 edition of the parish Magazine "The Quarterly" is now available to download. It can be found under the News section of the main menu. Previous editions are still available. It has come to our attention that people around the world have been receiving emails informing them that they have been selected as a delgate at an international conference to he hosted at St James the Greater, and requesting an initial payment. We would like to advise anybody receiving such an email that there IS NO such conference and that the email HAS NOT originated from us. Under no circumstances should should any payment be made. Unfortunately, internet scams such as these are becoming more frequent and that ALL unsolicited emails should be treated with suspicion, especially those requesting money or security details. If we manage to discover more concerning this particular scam or who is behind it, we will post information here. The Summer 2011 Choir Calendar and Music List is now available to download. Would members of the choirs please note that rehearsals start again on Friday 6th May at the usual times. There is no girls rehearsal on Thursday 5th of May because of The Sixteen concert, but the girls are required on Friday 6th with the boys. The Spring 2011 edition of the parish Magazine "The Quarterly" is now available to download. It can be found under the News section of the main menu. Previous editions are still available. The Spring 2011 Choir Calendar and Music List is now available to download. Would members of the choirs please note that rehearsals start again this week at the usual times. The girls are back on Thursday, boys and men on Friday. Sunday services this week are morning (girls and men), evening (boys, girls and men) for Epiphany Carol service (5:45 rehearsal). You may BOOK ONLINE here. The Winter 2010/2011 edition of the parish Magazine "The Quarterly" is now available to download. It can be found under the News section of the main menu. Previous editions are still available. The Autumn 2010 edition of the parish Magazine "The Quarterly" is now available to download. It can be found under the News section of the main menu. Previous editions are still available. As of Autumn 2010, the Girls, Boys and Mens Choir Calendars have been combined with the Music List, and this single document is now available to download. Would members of the choirs please note that the Girls AND Boys (just for this week) start back on Thursday 2nd September and the Men and Boys on Friday 3rd September. A NEW CHOIR is being formed, as a more formalised and regular version of the Voluntary Choir. Known as St James' Singers, it will rehearse twice monthly and sing for services here during choir holidays and festal services with the other choirs. If you like to sing and may be interested in joining such a choir, a first rehearsal has been scheduled for Thursday 9 September at 7.45 pm in the Ashman Music Room. It has been announced today, that our new Organist and Associate Director of Music is to be the present Assistant Organist, Michael Rule, who takes up his appointment in mid-August. His appointment follows the resgination of Mark Batten, our Organist and Associate Director of Music for the past six years, who has been appointed Organist and Trainee Teacher at Brighton College from September. It has been announced today, that Mark Batten, Organist and Associate Director of Music at our Church for the last six years, has been appointed Organist and Trainee Teacher at Brighton College from September. We congratulate Mark and wish him well as he completes his time at St James' and anticipates his future in new surroundings. Preparations are in hand to look for his successor. More information will be available in due course, or by contacting the directly. Over 400 people attended the service and tributes were made by Professor Marilyn Palmer, Squire Gerard De Lisle, John Florance, The Venerable Richard Atkinson and Canon Glynn Richerby. A copy of the Order of Service may be downloaded from here. The ST JAMES' CHOIRS will be giving a concert in aid of the ALZHEIMER'S SOCIETY on Friday 9 July at 7.30pm. Please bring family and friends to support this charity that provides advice and practical help to those affected by the condition - with the population living longer, we are all likely to be concerned at some point in our lives, either as sufferers, relatives or carers. For further information, please contact the Church Administrator, . The Summer 2010 edition of the parish Magazine "The Quarterly" is now available to download. It can be found under the News section of the main menu. Previous editions are still available. It is with great sadness that we hear of the death, on Tuesday last, 13 April, of Dr Alan McWhirr. Alan (73) has for many years been part of the church as Churchwarden, archivist and on the fabric committee, to mention just a few of the many areas he has been involved with. We knew he was seriously ill, but we did not expect to lose him so soon. A private funeral will be held at St James the Greater and we remember in our prayers all his family, especially his wife Helen, Rachel and James and their families. A memorial service is to be arranged, details of which will be announced later. The Spring 2010 edition of the parish Magazine "The Quarterly" is now available to download. It can be found under the News section of the main menu. Previous editions are still available. Owing to popular demand, we are pleased to announce that it is now possible to book online for some of the upcoming concerts held in the church. Payment can made via PayPal, which also allows a safe and secure method of using most credit and payment cards. PayPal accounts are free, but you do not need to open one in order to make payment. Tickets ordered will be posted to you promptly. Tickets are £28 to £8, available from the Church Office - the price has been kept as low as possible, while remaining consistent with the cost of bringing these professional musicians to Leicester. You may wish to donate tickets as a gift to music-loving friends or relatives. More information and a booking form may be downloaded from here. The Winter 2009 edition of the parish Magazine "The Quarterly" is now available to download. It can be found under the News section of the main menu. Previous editions are still available. It is with great sadness that we hear of the death, earlier this week, of Trudy Harris. Trudy (51) was for many years the life and soul of the Sunday Clubs and inspired many children with her infectious enthusiasm and she will be especially remembered by them for her short plays introducing the annual Christingle Services. The funeral will be held at St James the Greater on Friday 23rd October at 1030 and we remember in our prayers all her family, especially her children, Joe, Amy and Sam. Requiem - Gabriel Fauré is the latest CD of our choir and which was recorded during the All Souls' Day service, November 2008. The Autumn 2009 edition of the parish Magazine "The Quarterly" is now available to download. It can be found under the News section of the main menu. Previous editions are still available. RIDE AND STRIDE AND CHURCHES OPEN DAY on Saturday 12 September from 10.00 to 18.00. About 400 churches of various denominations around the city and county will be participating. Cyclists, walkers and recorders can ALL be sponsored: proceeds will be shared equally between your chosen place of worship and the Leicestershire Historic Churches Trust. Further details and sponsorship forms are available at the back of the Church. We need at least two people on duty during the day on two-hour shifts. Please sign the rota if you can help. We can always do with more than two per session, so do please add your name to the list even if it appears to be full! SONGS OF PRAISE on Sunday 6 September at 6.30 pm - with participation by members of the congregations that make up the Southern Edge Mission Partnership - St John the Baptist, Clarendon Park, with the Church of the Nativity, St Andrew's, Aylestone, St Christopher's, Saffron Lane, St Mary's with St Guthlac's, Knighton, and St James the Greater. This will be the first united act of worship since the inauguration of the Mission Partnership last May. Come and sing! The Choir now has it's own "Fan Page" on the social networking site "Facebook". If you are a current or past member of the choir, or just a keen follower, please consider joining. It has been announced today, that Mr Matthew Haynes has been appointed as our Director of Music with effect from September. Matt is currently the Choral Animateur for the Diocese of Leicester, in conjunction with Leicestershire Arts and sang with the St James the Greater Choir as a boy. It has been announced today, that Oliver Parker, our Director of Music, is to leave after the Choir Summer Trip to Salisbury Cathedral at the end of July. Oliver has been appointed as Head of Singing at Uppingham school, with timetabling that does not allow him to continue at St James the Greater. We are immensely grateful to him for all that he has done over the last three years and wish him well for the future. There will be an opportunity to express our thanks at Evensong on the 19th July. Preparations are in hand to look for his successor, with an aim of interviewing in July. More information will be available on this website in due course, or by contacting the directly. It can be found under the News section of the main menu. Previous editions are still available. The ANNUAL CHURCH BAZAAR is on Saturday 7 November. It's never too early to start collecting or making items for sale. Remember us when you're on holiday and bring back a souvenir for the holiday stall. The first of two open meetings (the second on Wednesday 24 June), followed by an Extraordinary Church Meeting after the 10.30 service on Sunday 28 June, to get together to consult about the issues of our time (see the Quarterly). All welcome. The SEASON OF ORGAN RECITALS begins on Sunday 7 June at 17.30. Mark Batten is the first of seven talented performers who will enliven our summer Sunday afternoons. Refreshments will be served in the Large Hall before Evensong. Retiring collections will be made, in lieu of admission charges. We are invited to celebrate this Christian festival in Evington Park, where a barbecue, bouncy castle, face painting, fun and games, and puppets will enliven worship. Free admission. APPLAUSE CLASSICS at 19.30 on Saturday 30 May at the Church of St James the Greater. Oliver Parker, our Director of Music, and our Choir will be participating in this concert, which is one of a series arranged and broadcast by BBC Radio Leicester to raise funds for local charities. Tickets £8. Seating unreserved. Further details at the back of the Church. The Church Administrator, is willing to forward bookings to the BBC. THE ANNUAL PAROCHIAL CHURCH MEETING is on Sunday 26 April at 11.45, following the 10.30 service, when we shall elect Churchwardens and members of the Parochial Church Council (PCC); receive annual accounts, and review our life together. If you wish to stand for election to the PCC or if you are, or wish to be, a Sidesman, you must be on the Electoral Roll. Ideally, everyone associated with St James the Greater should be on the Roll which is at the back of the Church, should you wish to check your entry. On Good Friday, everyone is encouraged to be present in the City for 'Christ in the Centre', starting from St Peter's Square, Highcross Centre at 10.00 am. For those who wish to come from that to the Hour before the Cross at St James the Greater, a frugal lunch of soup, cheese and bread is to be provided from 13.00 - please sign the list at the back of the Church before 11.00 am on Maundy Thursday. The ancient night service of Tenebrae (darkness) at 19.30 is especially recommended to those who have never experienced it. The Easter Eve Vigil is a wonderful anticipation of the dawning of Easter Day, with the blessing of the Pascal Candle from the New Fire in a darkened church - hence the late start at 20.30 - and listening by candlelight to the story of God's saving work from the beginning until the resurrection of Christ. The service lasts an hour and deserves strong support as the first service of Easter. Easter Day begins with a said service of Holy Communion according to the Book of Common Prayer at 07.00, followed by a Sung Eucharist at 08.30, with breakfast for the choir members, who stay on to sing for All Age Worship at 10.45. A shortened said service of Holy Communion follows at noon. The day culminates in a glorious Festal Evensong at 18.30. THE EXTENSION incorporating a lift and flight of stairs to new facilities in the Undercroft was formally handed over to the church by the builders just before Christmas - exactly to schedule. 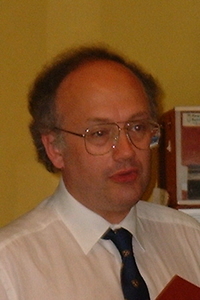 We owe a tremendous debt of gratitude to Will Warner who has seen though this project on behalf of the church from beginning to end - an intensive period of two years, including a frustrating year getting through all the 'red tape' of satisfying English Heritage and sundry amenity societies, and gaining necessary permissions. Then, when the building work began, Will made almost daily site visits - constantly smoothing the way for the contractors and all affected by the work going on - including the Vicarage! We thank Will for all of the time, patience and energy expended with unrelenting good cheer. Our thanks to Geoffrey Simpson and Tony Rudge who coordinated the fund-raising drive over six months up until Christmas which has been a great success both financially and socially. A Total of £75,000 of new money has so far been raised towards the project, not including the Gift Day on the 14th February. STAMP OUT WASTE! Please clip all the stamps from your Christmas mail and put them in the collecting boxes at the back of the Church. They will be used to raise funds for Action Deafness and Interserve - local charities we have supported on previous occasions. A WINTER WALK on Monday 29 December offers the opportunity to enjoy the local countryside before sipping a warming hot drink in front of Caroline Beardsmore's open fire, rather than getting glued to the TV or mooching round the interminable sales. More details and a signing-up board are at the back of the Church. THE SIXTEEN - the world famous choral ensemble with their internationally acclaimed conductor Harry Christophers are coming to St James the Greater again on 23 April 2009 (St George's Day) - plus a 22 piece Orchestra - to perform Handel's Coronation Anthems. Tickets are £34 to £10, available from the Church Office - the price has been kept as low as possible, while remaining consistent with the cost of bringing over forty high quality professional musicians to Leicester. You may wish to donate tickets as a gift to music-loving friends or relatives. This will be the concert of the year. TOWARDS £100,000 - Tony Rudge and Geoffrey Simpson would like to thank everyone who has responded to the Disabled Access Appeal - by a personal donation or by supporting one or more of the 14 events which have been held so far - and they are very grateful to the clergy and members of the congregation, who have organised the different activities. We have raised over £64,000 so far and, with the continued support of the whole of the St James the Greater family, we are determined to reach our target! The work is coming on very well and we hope to be able to start using the new facilities before Christmas. COPIES of the Address given by the Vicar at last Sunday's Battle of Britain Thanksgiving Service - Doing the best of things in the worst of times - may be downloaded from here. Alan McWhirr will give an illustrated talk on Thursday 30 October at 19.00 for 19.30, followed by a tour of the Church on Saturday 1 November at 10.00. The Revd Jane Sharp will be licensed as non-stipendiary Associate Priest at St James the Greater by the Archdeacon of Leicester, who will conduct the service of licensing at 6.30pm on Sunday, 5th October 2008. JANE SHARP is to be a non-stipendiary associate priest at St James's from the autumn. Ordained 11 years ago, Jane served a Curacy at St Andrew's, Aylestone. For the last 8 years Jane has been associate priest at St Mary's, Knighton - where she has had special responsibility for St Guthlac's. Jane is married with two grown up children, and a daughter aged 8. She lives a 5 minute walk away from St James's - in St Mary's Road, off Victoria Park Road. Jane assists her husband in running a family business. Family and business commitments will necessarily limit Jane's involvement at St James's - something we have been used to with Jane's predecessor Mark Battison as a non-stipendiary priest. Nevertheless, in accepting the invitation to transfer her ministry to St James's Jane says "I hope to play as much of a role in the everyday care within the parish and the Sunday worship as I can". Jane is very aware of the process of consultation with the congregation at St James's that led up to her appointment. She says "I am very sensitive to the fact that for some people this will be somewhat difficult and I will do everything possible to make things as acceptable as possible for them". We can assure Jane of a warm welcome, and look forward to all that she will bring to us. It can be found under the News section of the main menu. Previous editions will be left available for as long as space permits. "I am delighted to introduce this appeal, which is very close to my heart. Tony Rudge and I will work together - we are old friends and work together well - and will give our best shot. We are going for a six month campaign and hope that it will be a determined effort by the whole of the St James's family. The changes proposed to the church buildings will improve access between the church and the hall and provide accessible toilets using the Lady Chapel door via a new staircase and five-person lift. It will be a real challenge to raise our target of £100,000, but we have a wonderful and necessary cause, focused on a one-off appeal"
COMPLINE is to be held on Wednesday evenings at 8.30 pm - initially for a trial period in June and July - starting on Wednesday 4th June. The service will be held in the calm space of the Lady Chapel in candle light. It will be lay led and said or sung, depending on who comes together. The service should last for not more than 20 minutes. It is a quiet, contemplative and elegantly simple way to shed the stress and noise of a busy day. The Tallis Scholars, who have established themselves as leading exponents of Renaissance sacred music through world-class recordings and concert performances, are coming to St James the Greater on Thursday, November 27th 2008, with a concert entitled "Journey through Advent to Christmas". This was held at the Samworth Academy, Trenant Road, Leicester, on Saturday 10 May. It was attended by the Lord Mayor and our boy and girl choristers contributed to the service of dedication. The Coldstream Guards based in Kabul are appealing for items they can give as gifts to the civilian population, as part of the Hearts and Minds initiative. They would like toiletries, toys for children, notepads, pens, pencils, clothing and bedding. Clothes should be new, other items good-as-new. A consignment of items from St James the Greater has recently been sent and those who gave donations may be interested in these photographs. We hope to appoint someone on a part-time (mainly evenings) basis. Hours of work will vary to cover start and finish times of Church and Church Hall hirings. The job will be suitable for someone with a helpful and practical disposition, strong enough to move staging, chairs, tables, etc, who lives locally. Pay is to be on an hourly basis and might be worth approx. £2000 per year. ASCENSION DAY This year marks the 100th anniversary of the birth of the French composer, Olivier Messiaen. A devoutly religious man, his desire to express the truths of the Christian faith through music was the mainspring of his creative life. Our evening Eucharist on Ascension Day (1 May) will include one of his earliest and most accessible organ works, L'Ascension. This is being held at the Samworth Academy, Trenant Road, Leicester, from 2.00 pm on Saturday 10 May. Our boy and girl choristers will be contributing to the brief service of dedication. There will be book, cake and handicraft stalls, as well as various sideshows, including a Tombola. Tricia Dean and Marilyn Dorum will be glad to receive donations, either in Church or at the Church Office. Admission to the event is by programme: these are available (£1 each) from Tricia Dean. THE ANNUAL PAROCHIAL CHURCH MEETING is on Sunday 27 April at 11.45, following the 10.30 service, when we shall elect Churchwardens and members of the Parochial Church Council (PCC); receive annual accounts, and review our life together. If you wish to stand for election to the PCC or if you are, or wish to be, a Sidesman, you must be on the Electoral Roll. Ideally, everyone associated with St James the Greater should be on the Roll which is at the back of the Church, should you wish to check your entry. ACCOUNTS for the past financial year are available for inspection on the board at the back of the church. A QUIZ NIGHT with Supper on Monday 31 March (All Fools' Eve!) is being organised by the Charity Committee. Our quiz nights are always popular and are a great way of getting to know others at St James the Greater. We have invited fellow churches in the Southern Edge Mission Partnership (SEMP) to join us - St Christopher's always gives us a run for our money! All the questions are answered in teams of 6-8 people, so there is never any embarrassment! A Ploughman's Supper will be served in the interval. Tickets are available in advance from members of the committee (Caroline Beardsmore, Michael Bull, Martin Evans, Hilary Simpson and Polly Taylor). The cost is £6, which includes the first drink and the supper. Proceeds to Action Deafness, the Centre on Welford Road. Starting this week, an update to the website means that the weekly pew leaflet is to be available on-line, in PDF format, hopefully on the Friday preceding each Sunday. Links to it may be found in the calendar on the homepage (or the fullyear) and also on the new Downloads page under Information. Previous weeks will be left available for as long as space permits. We hope that this will be a useful resource for those who are unable to attend on particular week, for those who wish to keep in touch with what is heppening at St James, or for those who just want to see what is in store! We are most fortunate that Tricia is taking up this role alongside her other work as the General Secretary of the National Adult School Organisation. She has the advantage from the outset of being a leading member of St James - as chair of the Stewardship Committee for many years, and Churchwarden since 2006. The world famous choral ensemble with their internationally acclaimed conductor, Harry Christophers - are coming to St James the Greater as part of their 2008 Choral Pilgrimage on 22nd May 2008. According to Thy Word is the latest CD of our choir and features a selection of music sung by the choir at Evensongs during the summer 2007 week at Ely Cathedral. Congratulations to two of our congregation who have raised around £600 between them for the Leicestershire Historic Churches Trust by taking part in the annual 'Ride and Stride' in September. Polly Taylor walked around churches in Leicester and raised £373 whilst Paul Dean visited churches by bike and so far has collected £163 with more to come. The Bazaar, 'Stocking up for Christmas" - held last Saturday - had a great atmosphere and was a great success, raising £1,048 towards improving facilities for disabled people at St James the Greater. Thank-you to those who organised the event, to everyone who helped in any way and to those who came and supported the event. For further information, please contact the Director of Music, . The Bishop of Leicester, the Right Revd Tim Stevens visited St James the Greater on Sunday 18th November. During the 10.30 am service he licensed Anthony Green as a new reader in the parish. Although Anthony and his wife, Barbara, have their main home in Reading, they also have a residence in their hometown of Leicester and are with us for a considerable time each month and Anthony has been a much appreciated as an occasional preacher. So strong has their connection with us become that Anthony requested that his Reader's Licence be transferred from Oxford to the Diocese of Leicester and the Bishop was delighted to agree. Our Bishop is to visit St James the Greater on Sunday, 18th November. Bishop Tim will preside and preach at the 10.30 am service, during which he will license Anthony Green as a Reader. Following the service he will also re-dedicate the Hall after its recent refurbishment - close to the 40th anniversary of the original opening. Everybody is, of course, warmly welcomed to attend this service. If you normally only attend the 8.30 am service or Evensong, you are strongly encouraged to attend the Sung Eucharist as well on this day. Harvest Gifts of fresh fruits and vegetables were gratefully received by Action Homeless "to help keep our boys healthy" and parcels of non-perishable food and toiletries provided a great boost to the work of the Cathedral Welcome project for asylum seekers and refugees. The Harvest Supper & Beetle Drive on Wednesday was very much enjoyed by all who took part. The sum raised was just over £230 - this will be sent to support victims of the flood in Asia whose harvest was washed away this year. The church is looking for girls aged between 7 and 14, who enjoy singing, to join the Girls' Choir, which began this term. This is a new venture for the church and promises to be exciting and fun for all involved. Rehearsals are on Tuesday evenings during term time, from 18:00 to 19:30 and take place in the Choir Vestry (above the church hall). The entrance to the church hall can be found at the back of the church, on St James Terrace. Initially, the Girls' Choir will sing in a number of special services and concerts during the year, including carol services at Christmas and services during Lent and Holy Week. Like the boys, at the end of each term the girls will be paid a small amount for their work at the church and there are opportunities for trips, days out and other social events. Over the summer, the church halls have been undergoing a fairly comprehensive makeover. Until this work began, the facilities were pretty much unchanged from when the hall was opened in 1967. A new kitchen, some new flooring, replaced chairs and curtains together with complete redecoration will make the facilities much more serviceable and attractive to the large numbers from the local community who make use of them, as well as for use for church meetings and events. In addition, the entrance door is being replaced and a slope added, making access by the disabled much easier. The 6th May 1997 saw the launch of the original website for the Church of St James the Greater, Leicester. Now, over 10 years later a long overdue update has taken place. In addition to a fresh appearance to the site, new photographs and extra information has been added, including a virtual tour of the church and diary and news sections. The diary may updated by selected people, which should lead to the site being a better source of information for activities at St James. There are still a few areas awaiting new information and it is hoped that these will be expanded soon. Mark Battison, Non-Stipendiary curate at St James the Greater for the last three years, is to move to a new sphere of ministry which will allow for closer integration with his business and family life.